To increase milk production in dairy cows, some farmers give them injections with a hormone known as bovine somatotropin. The U.S. Food and Drug Administration approved the use of this hormone in 1993 and have found no evidence to suggest that it results in the production of milk that is unsafe for humans. The use of BST is still considered controversial, especially because of the possible health effects it can have on our bovine friends. Bovine somatotropin is a natural protein-based hormone that a cow produces in her pituitary gland. This hormone regulates her growth, metabolism and milk production, with higher levels of it resulting in more efficient milk production. The FDA approved a commercially available version of this hormone that is produced in a laboratory using genetic recombinant DNA technology. This version of BST, also called rBST, is relatively the same as the natural version of the hormone a cow's body manufactures. When a cow is injected with BST, the hormone stimulates milk production by increasing the cow's natural levels of the insulin-like growth factor called IGF-1. Cows get the subcutaneous BST injections either in the neck or the tail every 14 days. Those who are given the injection into the neck tend to produce more milk than those who get the injection in their tails. Because BST is a type of protein-based hormone, if a cow ingests it, it has no effect on her at all. Unlike steroid-based hormones, BST is completely digested in her stomach and small intestine. To increase her milk production, you must give BST as a subcutaneous injection to a cow. Cows given BST injections produce an average of 15 percent more milk than those who don't receive it. They also make more efficient use of the feed they receive in terms of milk production as well. The milk produced from cows treated with BST has few differences from other types of milk, especially in terms of taste. It does contain twice the amount of IGF-1 and a slightly higher level of biotin. The FDA has determined that these differences don't pose a health risk to humans. While BST injections themselves don't seem to cause a risk to humans in terms of changing a cow's milk, they do cause some detrimental health effects to the cows themselves. Both the European Union's Scientific Committee on Animal Health and Animal Welfare and the Canadian Veterinary Medical Association recommended against the use of BST injections in cows because of these possible issues. 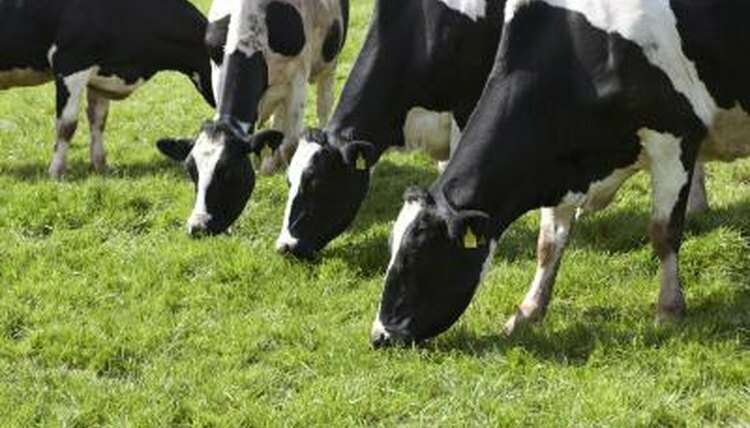 The risk in treated cows for medical conditions like mastitis, an infection of the mammary glands, increased by 25 percent and lameness, due to foot and leg problems, increased by 50 percent, according to the CVMA. The EU's SCAHAW also found that BST can cause problems with reproduction, heat sensitivity, digestion and immunity. Cows can also develop injection-site lesions if continuously injected with BST every 14 days. The FDA has approved BST injections in cows throughout the United States and does not require any special labeling of the milk for the public. However, most manufacturers that don't use BST do label their products to indicate this to the consumer. While BST does increase milk production, it may do so at the cost of the cow's health, leading to an increased use of antibiotics and other types of veterinary care for her. Simply improving the feed and general housing conditions for the cow can also improve a cow's milk production without the use of a hormone. Even a bit of pampering like a massage can increase milk production and has no adverse side-effects at all.